Natalie was found as a stray back in June of 2010. Amazingly enough, she is still waiting for her forever home. The Humane Society of Huron Valley has no time limits for healthy and treatable animals. Natalie stayed in the shelter for a number of months but when she became frustrated in her cage, she was moved to an HSHV foster home. She has been happily residing there for over a year. It is our sincere hope that someone will read her story and watch her video and finally give this beautiful cat her own permanent home. Natalie is a very sweet and cuddly cat. She sleeps under the blankets with me or my oldest daughter. She is very friendly with visitors and usually runs to the door when she hears the door bell. She's not too crazy about small kids that might try to pick her up or not know how to pet her the way she likes so she should be in a home where any kids are at least 10 years of age. She loves to chase around string toys and is happiest when the house is quiet. It has taken many months for her to be able to be in the same room with my cat. She still keeps her distance, so she would do best in a home where she is the only cat or in a home with someone willing and able to let her have a calm and slow introduction with another feline. As you can see, Natalie is playful and fun to be around. 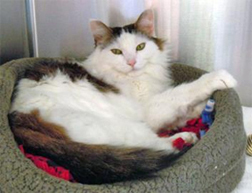 She has soft, medium to long fur and enjoys a home where she can stretch out and entertain her guests! What a cool cat companion she could be for the right family. To visit Natalie, call 734-661-3520, and we will arrange for you to meet her. She can't wait to see you.